The relegation battle on Hannover's hands only seems to get tougher every week. Bayer Leverkusen: (4-4-2) Leno; Hilbert (Jedvaj 78'), Tah, Toprak, Wendell; Bellarabi (Mehmedi 78'), Kramer, Kampl, Calhanoglu (Brandt 73'); Chicharito, Kießling. Hannover 96: (4-1-2-1-2) Zieler; Sakai, Marcelo, Hoffmann, Albornoz; Gülselam; Yamaguchi, Schmiedebach (Bech 65'); Prib (Saint-Maximin 76'); Almeida, Szalai. SCORE: 1-0, Kießling 44'. 2-0, Hernandez 63'. 3-0, Hernandez 87'. REFEREE: Tobias Welz (Wiesbaden). Booked: Gülselam (25'), Sakai (62'), Hoffmann (65'). Javier Hernandez notched up his 20th and 21st goals for Bayer Leverkusen since joining the club on loan, as die Werkself continue to push for a UEFA Champions League berth. Stefan Kießling grabbed the other goal in a comfortable win over Hannover 96, who are looking devoid of confidence. It was a game filled with chances from the very opening exchanges between the sides, and both had their own exclusive was of going about it. Hakan Calhanoglu was the key architect for Leverkusen, seeking out Kießling for an early header that went wide. The Turk also sent two free-kicks of his own at goal, although neither found the net. Unsurprisingly, it was left for Hannover to counter attack and try to make the best of a bad situation. Manuel Schmiedebach and Hugo Almieda both went close on the breakaway, with the latter looking to score his second in as many games. Edgar Prib almost scored from a corner, but that followed the same suit as all other chances. Despite all the opportunities that were passed up, there would be a goal at the very end of the opening period. Calhanoglu and Kießling combined to give Leverkusen the lead, as the latter headed in the former's corner from close range. It was a horrible time for Hannover to concede, but nothing less than Leverkusen deserved. Kiessling heads home the game's opening goal. | Image credit: kicker. Leverkusen could have killed the game off within the opening 10 minutes of the half, with two huge chances falling their way. Karim Bellarabi shot just past the move after the restart and Calhanoglu came agonisingly close moments later. His free-kick hit both the bar and post before Miiko Albornoz hooked the ball off the line. Hernandez then sealed the deal just after the hour mark. 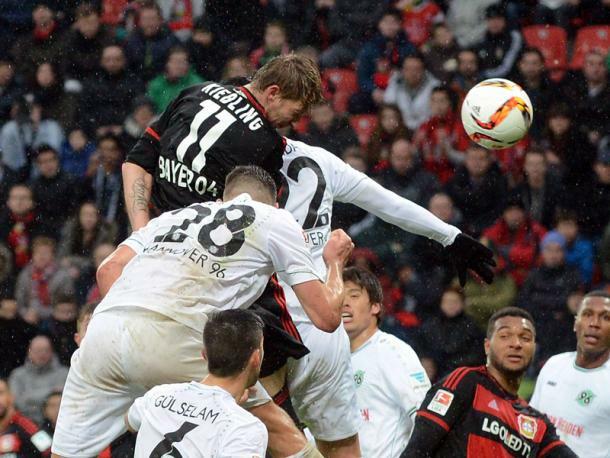 Kießling was fouled in the box by Hiroki Sakai, giving the Mexican forward a chance to net from the spot. He confidently stepped up and shot past Ron-Robert Zieler, continuing his fantastic run. Chicarito was not finished there and added his second, his team's third, with a clinical finish in the final few minutes. Leverkusen jumped up to fourth with the win and into the final Champions League qualifying spot, just three points behind third-placed Hertha BSC. Hannover, on the other hand, are five points from safety and sit bottom of the table.